Peeps might be just marshmallows with a sugar coating, but for us, they mean so much more. Peeps evoke a memory—like a dream from a carefree childhood when our toughest challenge was finding hidden baskets of candy. Yet, as adults, aren't we more responsible than that? Instead of candy, we now collect booze, but if the candy-colored shelves of the vodka aisle are any indication, not much has changed. Virtually every wonderful flavor of our childhood has made its way into vodka. Like bottling sweet elixir from a river made of rainbows, it as if spirit companies draw inspiration from Willy Wonka's liquor cabinet. We thought we had reached the pinnacle of flavor decades ago with Absolut Citron, but this was only the beginning. Now, we have incredible flavors like Chocolate, Vanilla, Bubble Gum—and would you believe Birthday Cake, Whipped Cream and PB&J? There are so many fantastic flavors that we cannot collect them all. Practically everything in the candy basket is represented and more, so we could't be happier! And with Marshmallow vodka, we have come full-circle. Yes, you can now buy what is effectively, Peep-flavored vodka—but you don't have to buy to try. Many of these delectables can be made at home. Measure equal amounts of mini marshmallows and vodka. Pour vodka over the marshmallows in a jar. Allow the marshmallows dissolve, agitating if needed. 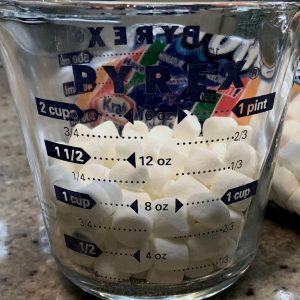 For rapid infusion, use a huge jar and microwave the marshmallows to expand the air first, then add the vodka and shake until completely dissolved. Store in the freezer and serve when chilled. Made using the steps above, the volume of vodka will increase by about 25% weighing in at a slightly sweetened 64 proof. 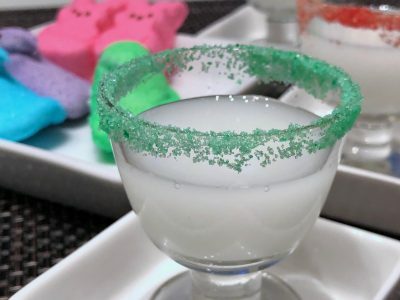 Marshmallow vodka can be used to make all sorts of amazing and unusual cocktails. We think it could become our spirit of choice. For example, a graham cracker rim and some chocolate syrup is a sure path to a campfire classic. Or how about adding it to hot cocoa, or making a rice crispy jello bar? While these are great ideas, they are a little too involved, so we are opting for a Peep Shot. We don't usually feature shots here, but you can sip this too. They are mini cocktails, aren't they? Of course, like any commercial vodka, presentation matters the most, so we need some colored sugar for the rim. Add a few drops of food coloring to granulated sugar in a plastic bag or jar, seal and start shaking until the color is mixed throughout. Adjust with more coloring as needed. If required, spread the colored sugar onto a baking sheet and allow it to dry. 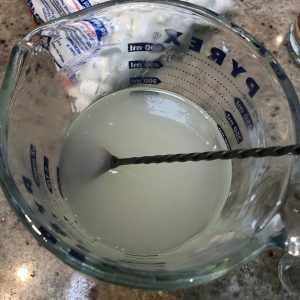 Once you have the colored sugar for the rim, dip your shot glass into a plate of water to moisten the rim, then into the sugar to get a nice coating. Allow the shot glasses to dry a bit, then carefully freeze them. When ready to serve, pour the marshmallow vodka into frozen glasses and line them up for guests. A Peep on the side makes a nice garnish. No peeps were harmed to create this amazing recipe.